Many villages are available in Tana Toraja Regency. If you are visiting South Sulawesi Province, you need to drop by in Nanggala Village. What is in there? It shares the same characteristics to any villages in Tana Toraja. That means you may encounter Tongkonan and some local ornaments. Not to mention there are ancient tombstones. However, the village offers a distinct nuance, especially at night. The atmosphere becomes serene and romantic in the evening. Due to this reason, you should come to this area with a companion. It is a waste to enjoy such beautiful settlement alone, after all. 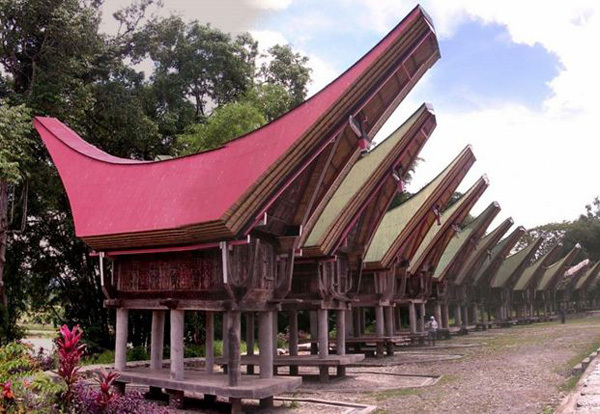 As mentioned before, you can find several traditional houses of Tana Toraja in Nanggala Village. Near to the houses, you may see bamboo trees. When it comes to the villagers, they are friendly so you can approach them even without good Indonesian Language. Some of the villagers are the descendants of the Luwu King, actually. If you come at the right time, you are able to witness the death procession in Nanggala. Rambu Solo is not an exception. Therefore, you should carry a camera. The best thing to do in Nanggala Village is to witness the local death procession. The first phase is the removal of the corpse to Alang (a shed). Next, it must be placed into Lakkian (a container). These procedures should be done simultaneously. The next phase is the guest reception. Once it is done, there is an interesting entertainment called the buffalo fight. More intricate procedures are available, actually. You are lucky if you can witness the entire procession. Nanggala Village becomes an interesting vacation destination to enjoy the local culture. Apart from Rambu Solo (death procession), you can also enjoy other interesting things. For instance, it is the buffalo sacrifice. The thing is the executioner should only take one slash in beheading the buffalo. Apart from buffalo, they also use other animals especially pigs. This sacrifice is part of the death ceremony, so you should witness it as well. Each buffalo has a value and price. An expensive buffalo represents a high society status, actually. People in Nanggala Village are quite friendly. They even share the meat of such sacrificed animal to tourists. Only the skull of the buffalo may remain. It is because the villagers use it as an ornament in their house. Those with the most buffalos' horns are considered noblemen. What’s next? As a tourist, you are able to enjoy local foods. For example, there is Pantollo Bale. In terms of appearance, it is similar to a grilled fish. However, it comes with a unique taste. Nanggala Village is part of Tana Toraja Regency. For those who come from Makassar City, you only need to take Poros Barru – Makassar Street. The distance is 327 km and it takes about 8 hours. This trip is indeed tiring, but it is worth a try. What about those who come from other provinces? A plane is the best transportation. In this case, you only need to reach Sultan Hasanuddin International Airport. The location is in Makassar.